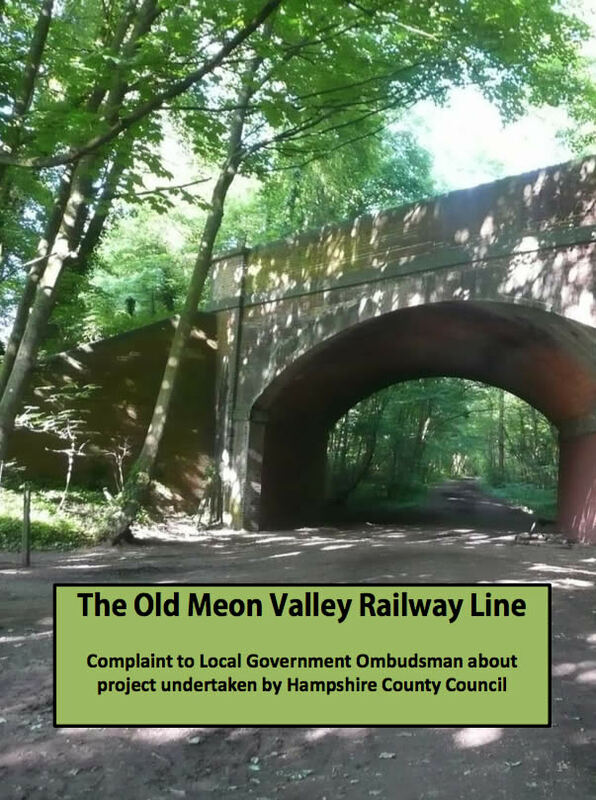 This complaint is being made on behalf of the Meon Valley Old Railway Line Users Group, an informal collection of around 2,600 people who use the old railway line. Introduction The old Meon Valley railway line (or as Hampshire County Council has rebranded it "The Meon Valley Trail") is a much-loved 11-mile bridleway stretching from the village of West Meon to Knowle Junction, near Fareham. It runs along a stretch of the disused Alton to Fareham railway line which was closed in 1962 as part of the Beeching cuts and has been enjoyed by walkers, horse riders and cyclists for around 40 years. Between 2014 and 2015, Hampshire County Council, together with its partner the South Downs National Park, undertook a project to "upgrade" the old railway line using £400,000 of public money. However, as this document will demonstrate, it is now apparent that Hampshire County Council and the South Downs National Park rushed through the project having undertaken no proper consultation, without planning permission, having inadequate communication with stakeholders, weak management and, when faced with questions and criticism, the two authorities chose to attack or ignore their critics rather than try to address their concerns. Furthermore, Hampshire County Council and the South Downs National Park have placed inaccurate information in the public domain and misinformed the media. This document, largely based on information obtained from the South Downs National Park, and, to a lesser degree Hampshire County Council, under the Freedom of Information Act, sets out some of the key criticisms and explains how £400,000 of public money has been spent on a project that was at worst unnecessary in scale and, at best, poorly delivered. It also reveals many areas where Hampshire County Council has failed to engage with the public or address their concerns, breached the terms of the Freedom of Information Act and sought at every stage to ignore genuine concerns, something which ill-befits a public body. A willingness to engage properly with concerned users could have helped to avoid this complaint.